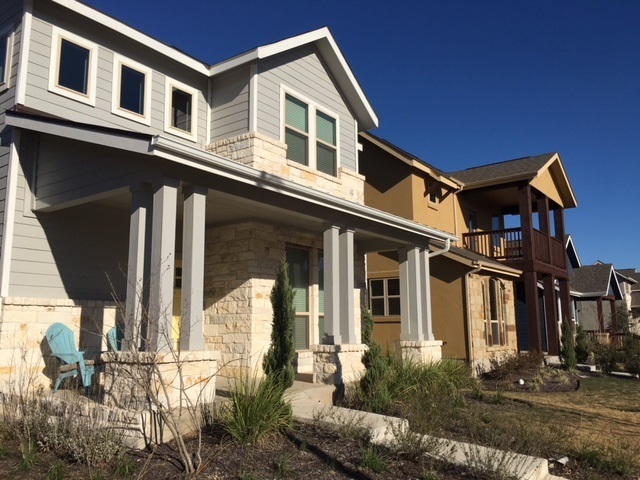 Goodnight Ranch is a master-planned community under construction on the southeastern corner of Travis County that is being pitched as the affordable version of Mueller because of its walkability to nearby retail, commercial space, trails and nearby Onion Creek Metro Park. The Goodnight Ranch community will be massive when it's built out, with 3,500 homes, and 225,600 square feet of retail and commercial space. There are several dozen homes there now, and the entire community isn't expected to be finished for another 10 to 15 years. The portion north of Slaughter Lane is where the homes are being built now. The part south of Slaughter, where all he retail and commercial space will go, likely won't be constructed for a few years, according to some of the home builder representatives I spoke to. I went on a tour of Goodnight Ranch this week and want to share with you some of what I learned. *The history of Goodnight Ranch is fascinating. Not that long ago, Goodnight Ranch was a dairy farm and ranch on the outskirts of Austin, owned by the Goodnight family. If that name rings a bell, it's because Charles Goodnight is a famous cattle rancher, depicted in a half-dozen western novels, and he has his own Wikipedia page. *The house styles at Goodnight are adorable and varied. Goodnight Ranch has three home builders: Center Homes, Homes by Avi and M/I Homes, and each offered varied floor plans and styles, so you avoid the cookie-cutter look. *The prices are phenomenal for new construction. The base price of a Centerra Homes is $264,990, and goes up to $299,990. M/I Homes started at $319,990 and went up to $354,825. Keep in mind these are base prices and don't include any common upgrades. Homes by Avi are starting at around $240,000 and are duplexes. *You're not too far from civilization. The Southpark Meadows shopping center is about a mile down the road, and that has everything from a movie theater to a Best Buy and a Target. You're about eight miles from downtown, which isn't bad in a perfect world with no traffic problems, and we know that isn't Austin. *There is an elementary school already built just outside the development, and Goodnight is in the Austin Independent School District. A representative for Centerra Homes explained that there is a planned second school site also near Goodnight and the expectation is that it would be a middle school. AISD also has plans to build another high school in Southeast Austin because of the growth coming from communities like Goodnight Ranch. *One of the drawbacks to Goodnight Ranch at this moment is the lack of a nearby grocery store. There is a Target and Wal-Mart close by, but the nearest HEB is either at Slaughter and Manchaca or William Cannon and Interstate 35. HEB has plans to build a grocery store at Slaughter and Interstate 35, but it isn't clear when this might happen. *Commute time could be an issue, but it depends on where you work. But there are backroads to take to get to Highway 71 if you work in western Travis County, and there's the nearby 130 toll road if you work in North Austin. Overall, I was impressed with the value that Goodnight Ranch offers in this early phase. These prices are going to go up over time as the community gets built out, and as amenities like the proposed HEB at Slaughter and Interstate 35 make it more attractive. That makes buying now the smarter bet. Don't shop for a new home without working with a Realtor who represents your interests. Call Lilly Rockwell at 512-413-1975, or send her an email at lilly.rockwell@cbunited.com if you want to work with a knowledgeable and ethical Austin-born-and-raised Realtor.